Coastal California? 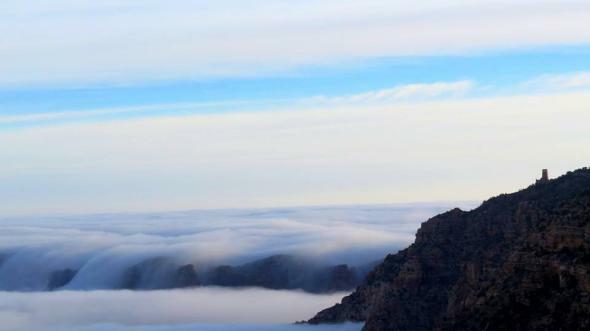 Nope, just a breathtaking view of fog spilling into the Grand Canyon. On Thursday, a thick fog filled Arizona’s Grand Canyon—a rare weather phenomenon called a “total cloud inversion.” The fog’s exceptional fluffiness turned the canyon into a mystical sea of clouds, complete with “tides,” as a timelapse from the National Parks Service shows. Cool, wet weather several days ago helped give rise to the foggy extravaganza. Over the last few days, all the extra moisture condensed into fog and was held in place by a high-pressure system that quickly followed. On Thursday morning, a slight eastward shift of the winds funneled all that fog down the Colorado River and into the canyon, meteorologist Cory Mottice told me. The clouds were trapped there most of the day by relatively heavier, drier air that moved in overhead, completing the “inversion”—a stable atmospheric condition where temperature actually rises with height. The moment was so perfect that Mottice, who works for the National Weather Service in Flagstaff, decided to make his first-ever trip to the canyon to see the fog after his overnight shift ended on Thursday morning. I reached him by phone on Friday. Mottice said he spoke to several tourists, many of whom were disappointed that they couldn’t see a more typical view. “I explained to them how lucky they were to see it that way, and they were a little bit happier after that.” The last time this happened was December 2013.